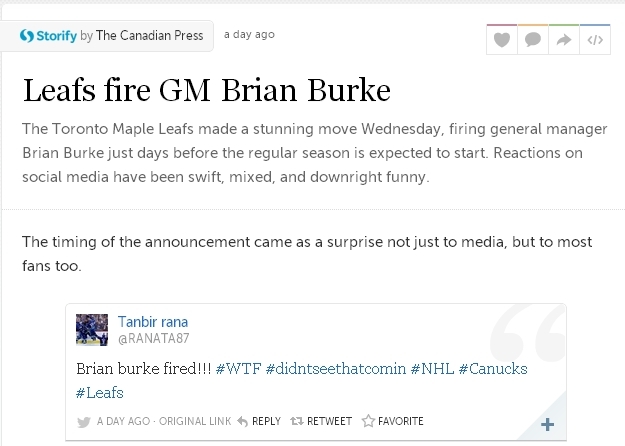 For Toronto hockey fans, Jan. 9 was a big news day: the firing of Toronto Maple Leafs General Manager Brian Burke was completely unexpected. Also unexpected was how Canadian Press, the country’s wire service used Storify to tell the story. Think about it: A wire service, whose business model relies on revenues from subscribers, aggregated reaction to Burke’s firing and posted it online for the general public. I asked Andrew Lundy, CP’s new Director of Digital (Wednesday was his third day on the job) about the decision to use Storify. Why did CP decide to Storify the Burke story? Will we see more of this? We knew that reaction and commentary would be plentiful in social media. People don’t wait any longer to listen to what paid pundits have to say on an event like Burke’s departure before commenting, and Twitter and Facebook are the venues for that reaction. Storify is a powerful way of curating the flurry of activity, while preserving the integrity of original posts and being fully transparent. Yes, you’ll see more of this. We just published our second Storify today, a curation of Canadian astronaut Chris Hadfield’s best tweets. He’s been a tweeting machine since he’s been on the ISS, and not just in quantity, but quality: amazing photos, compelling conversations with average people, and of course the back-and-forth with William Shatner. It’s easy to use, powerful, and free. When you consider the avalanche of social media elements that a big and/or viral story can generate, it could take hours to pore over it all the traditional way and quote or paraphrase. Storify makes it so easy. It also taps into the main social media platforms that I find relevant: Twitter, Facebook, Youtube, Flickr, Instagram, Google Plus. And it’s free, so there’s no barrier to entry. However, free doesn’t mean crap in this case, which is great. Storify does what is claims. Storify enables community involvement in storytelling, rather than the straight reportage we usually see from CP. What are the challenges in involving the public? CP has to maintain its high journalistic standards, so there’s never a time when we’d publish a raw feed of reaction as a story; it has to be curated by a journalist. For instance, you can imagine the vitriol that came in the wake of the Burke announcement yesterday. There were hundreds of tweets and Facebook posts we couldn’t use — some for raw profanity, but others because they were non-sequiturs or strayed into irrelevance. It’s important to realize, we’re using Storify with a defined narrative in mind. We’re not just grabbing the most recent posts, we’re trying to tell a story and using those posts to illustrate that narrative. To me, that’s just an extension of the traditional use of quotes and sources that have been a hallmark of reporting since the beginning. Tell me about the analytics – how did it do? Did it see a lot of traffic? That’s hard to answer, because CP itself doesn’t generate traffic. We produce content for our subscribers. So I don’t have an Omniture or Chartbeat report to draw on. I do know that some of our larger subscribers used the Storify embed prominently, attached to their main Burke stories, and the page views on those were in the thousands for at least two subscribers. I was pleasantly surprised, considering 1. it was our first time doing this, 2. we have very limited promotional channels, and 3. this was a spot news event with no advance warning, so no kind of marketing prep was possible. Do you see this as a change in how CP disseminates news – not just to subscribers, but to the public (free)? Not really. While people could, I suppose, go to the native Storify page, it’s far more likely they’ll consume our Storify efforts on our subscribers’ platforms. These aren’t really stand-alone entities, I believe. They work best in the context of larger stories and features. I view this as another method of storytelling, and I know our clients do too, since many of them use it. In my former life at globalnews.ca, it became a staple of how we’d cover an evolving story. What was the reaction from CP’s journalists as this was published? Very positive. First, smiles that it was so easy to do, and then a recognition that we were effectively telling a side of the story that would have been hard — if not impossible — to do otherwise. Streeters? That method of storytelling has almost become a punchline. There’s also been a great response to the traffic generated by our subscribers, and their willingness to use it on an important and breaking story. My boss is happy, so I’m happy. Do you see CP sharing news in more non-traditional ways like this? Yes. If it accomplishes our goals of good storytelling and effective distribution while maintaining top-level standards of journalism, there’s no reason why we won’t keep doing that. Monetization is also a factor, and we’re exploring whether this becomes “premium” content. We reasoned that, right now, it’s better to try it, refine our methods, and gauge subscriber interest, so we can inform the monetization decision down the road. As director of digital, how do you hope to do things differently at CP? What changes can we expect? CP is a wonderful organization I’ve admired since I started chasing ambulances at the St. Catharines Standard in 1990. Its integrity hasn’t waned a bit since then, despite the storms it’s weathered. So preserving that integrity is top priority. All too often that goes by the wayside while we chase the next shiny digital object. That said, I’m hoping to be able to be more strategic with how CP incorporates digital technology. Slim resources have meant everyone’s been tactical in the past — and that’s still produced some top-shelf digital journalism — without being able to focus on a bigger picture. I’m hoping that means better use of social media, a more thorough digital sensibility among the reporters and editors, continuing strong emphasis on video, more robust planning for both big events and ongoing coverage. There’s a massive appetite to do all those things, through all layers of the company. It’s been a great first week, and I think it will only get better. Let me clean those up Andrew. Shoul have caught them on the first go around.